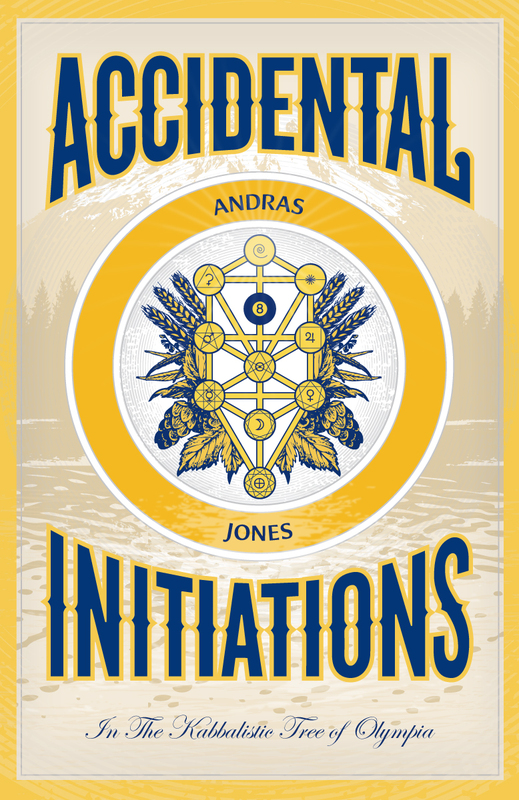 It’s exactly six months since I began Accidental Initiations with a psychedelic fueled walk in The Kabbalistic Tree of Olympia on the summer solstice. My intention for this winter’s solstice was to do likewise and “allow what needs to die to die and leave me free and empty to proceed into 2012.” I must admit I wasn’t looking forward to this winter walk of death but I was prepared for it. My body had other plans and, on Sunday, I came down with a hacking cough and flu bug which is still rattling around my lungs. Sickness is another kind of death trip, perhaps even more appropriate for its icky slowness than an ecstatic chemically fueled purging, so I surrendered to it, just as I would the medicine. In the midst of this bodily journey through the underworld, a theme emerged which took me back again to the turn of the century and another production at The Capitol Theater. 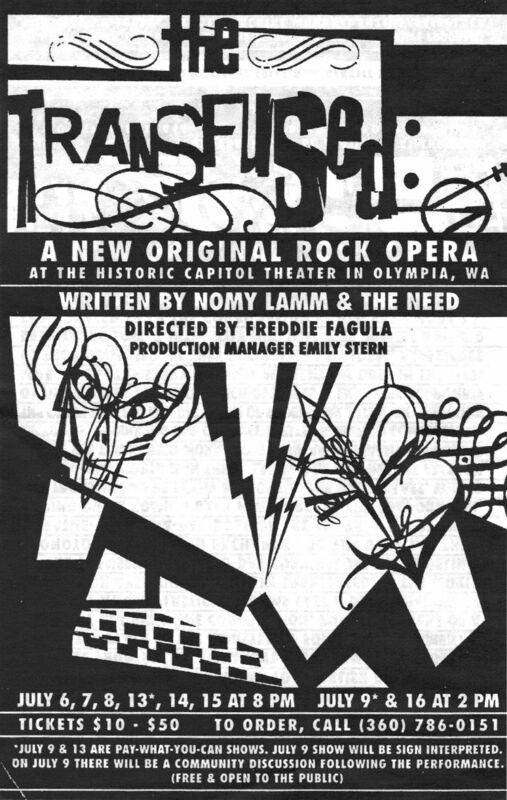 The Transfused was a punk rock opera created by Nomy Lamm, The Need and Emily Stern in which I played a role as an actor. In that millennial summer Time Magazine was calling Olympia “the hippest town in the west,” Sleater-Kinney were exploding on the college charts, and festivals like Ladyfest and Homo-A-Go-Go were drawing big numbers to explore alterna-freedom in our city’s streets, but the coolest thing in town that season was The Transfused. A dystopian fantasy of rebellion and transformation, The Transfused, hit all the right notes. 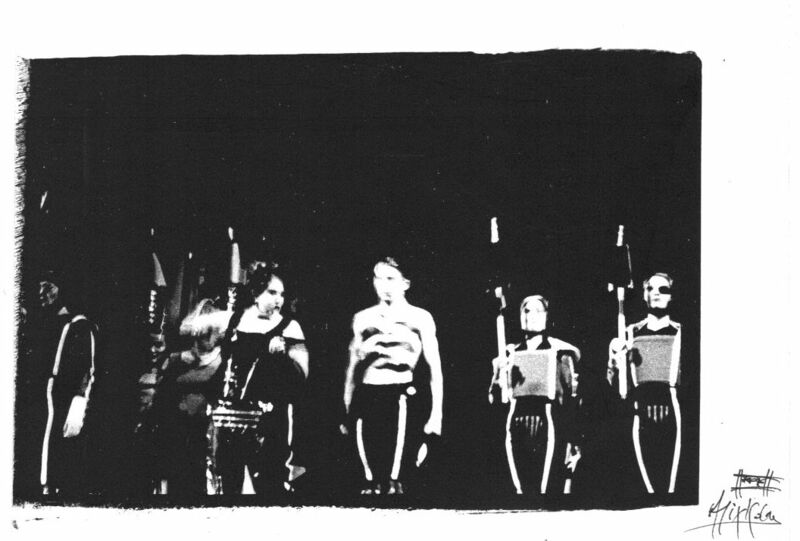 The Need’s music (written with Nomy Lamm) was dark and intelligent and full of robotic punk swagger. 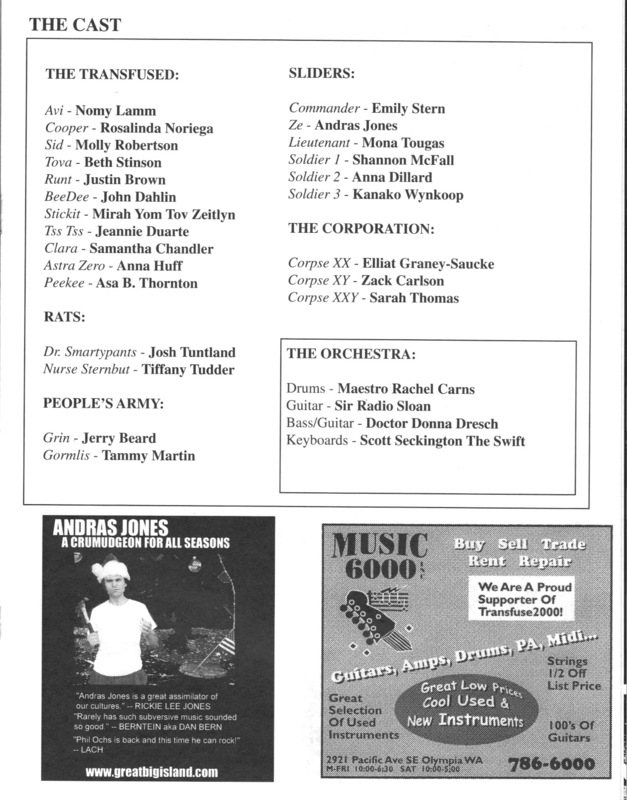 The cast and crew included current and future local celebs like Mirah, Anna Oxygen, Nikki McClure, Tae Won Yu, Lois Maffeo, Rebecca Pearcy & Zach Carlson. The story takes place a hundred years after the collapse of the American empire when the land is ruled by “The Corporation” which forces the mongrel population to work in the “Fat-Free-Fat factory” to earn their “Fix.” The Fix is a drug which is supposed to keep the mongrels safe from the post apocalyptic environmental degradation but, in fact, just keeps them strung out and coming back for more. 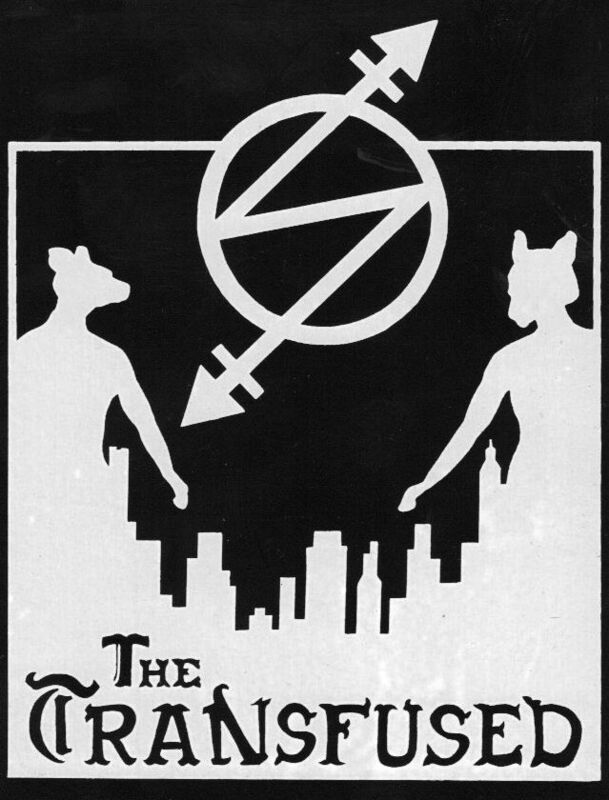 During the course of the play, one of the mongrels decides to quit The Fix, get clean, and lead a revolution against The Corporation and its toady soldiers (in the play they are called “Sliders”) who guard the factories. My character was one of these Sliders. When I auditioned they originally wanted to cast me as one of the corporate overlords but I turned this role down and they instead offered me the role of Ze, the masochistic underling of his commander (played with menacing verve by Emily Stern.) Originally Ze was a peripheral character, but over the course of the production he evolved into a pivotal part of the story, and his song “Child Of Destiny” became one of the big hits of the production. For me, as a white hetero male who grew up in this town, to finally feel accepted, even celebrated, by the local queer and feminist elites was incredibly rewarding. I don’t know if anyone who doesn’t live in the northwest can even comprehend a dynamic like this but I guess that’s part of what makes this region such a unique training ground for conscious evolution, as explored in AI. Cut to this week, with me sick at home, listening to Phil Ochs whose birthday was on the 19th, and working on archival projects. One of these was scanning artwork for my digital archives. Mostly flyers and posters from my band’s many tours, but I also scanned The Transfused artwork. While I was doing this my old friend and creative conspirator Willie Wisely posted a glowing tweet about a video clip of “Child Of Destiny” that he had synchronistically stumbled upon that day. Meanwhile, in the wider world, The Transfused’s dark vision of the future seemed to be taking root with Obama set to sign into law the National Defense Authorization Act, which makes it legal to indefinitely detain American citizens without charge or trial. With America building new prisons and dismantling the legal safeguards of a free society, my mind turned again, as it has so often over the last month, to what can be done to make prisons a better place to live. Maybe it’s a failure of imagination on my part that I don’t see the Occupy Wall Streeters turning the tide at this late date but, assuming that the worst comes to pass, I want to know how I can help make the best of it. Recently, I’ve had the inspiration to bring Radio8Ball and my synchronicity work to juvenile detention centers and, eventually, to prisons. As a form of entertainment which trains our minds to recognize and increase the experience of synchronicity, it seems Radio8Ball might be ideally suited to enhance the incarceration experience. You can’t keep synchronicity out, and a person in touch with sync is more likely to be inspired, optimistic and creative, all qualities which can preserve our humanity through difficult times. I don’t know anyone who works in juvenile detention facilities or prisons and I’m not exactly legitimate on the level which might get me invited to present R8B in the correctional environment based solely on cold calls. Lots of credits but no credentials. So, I’ve just been putting it out there to the universe and hoping to sync up with the right person to connect me with this role. Which brings us to today, the solstice, where it all comes together. This morning I woke up and the fever had broken. I didn’t exactly feel well but I definitely felt better. I decided to go for a short walk and enjoy the fresh crisp air and solstice energy. As I was walking down 4th Avenue, a voice called my name. I turned around to be greeted by Rosalinda Noriega who played the role of Cooper in The Transfused. We haven’t seen each other in years. I should be used to this kind of sync, and I am, but it still floored me, and I told her so. I asked her what she was up to and she told me that she is currently working with Partners in Prevention Education, a local organization which works with homeless and at risk youth to eliminate violence. I asked her if she knew anything about how to get involved with kids in juvenile detention. She said she did and she would send me a name and e-mail of someone to get in touch with. As I solstice walked The Tree later in the day with the sun setting, I could feel the light returning. I drew it in and felt inspired by my lack of knowledge of what would come next. I was present to the present, welcoming to the future, and happy to be right where I was. Full of what can only be described as faith, I came out of the alley, down into the park, and what should I see? My fellow Olympia Jews lighting the big menorah at the Chesed corner. I joined them, singing Chanukah songs, sharing the ritual, and feeling perfectly in sync. When life is this magickal who needs acid? This entry was posted in Kabbalah, Olympia, Prison, Psychedelics, Riot Grrl, Synchronicity and tagged Anna Oxygen, Chanukah, Child Of Destiny, Emily Stern, Hippest Town in The West, Homo-A-Go-Go, juvenile detention, Kabbalah, Ladyfest, Lois Maffeo, Mirah, National Defense Authorization Act, Nikki McClure, Nomy Lamm, Obama, Occupy Wall Street, Olympia, Partners in Prevention Education, Phil Ochs, prison, psychedelics, Radio8Ball, Rebecca Pearcy, Rosalinda Noriega, Sleater-Kinney, synchronicity, Tae Won Yu, The Capitol Theater, The Need, The Transfused, Time Magazine, Willie Wisely, Zach Carlson. Bookmark the permalink.